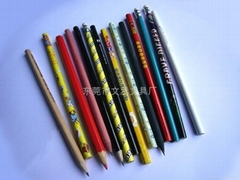 Established in 2002, wencheng stationery company specializes in producing pencil、 color pencil 、jumbo pencil、pencil sharpener 、pencil box、and stationery sets. Strict QC system, quick delivery and competitive price enable us reputable at home and abroad, and the conformity of our products to EN-71, ASTM-D4236. Products are exported to Japan，Europe and America, Asia,etc. Wencheng also provides OEM 、ODM service for famous brands, such as McDonald's, Coca-Cola, Sony Ericsson,Garfield Cat, Barbie,Tweety,Disney,Tarzan and so on. We welcome OEM orders and all customers from all over the world. Hoping our mutual efforts will lead to a brilliant future!